The 2013 Honda Odyssey has been a big hit in Goshen, NY and the surrounding communities, and you can check it out now at Middletown Honda! This exceptional minivan offers plenty of interior space and versatility, impressive power, and top safety scores, all for a great price. That said, there are other minivans on the market, and the Odyssey has some stiff competition for the likes of the 2013 Chrysler Town & Country. So how do these two minivans compare? The 2013 Chrysler Town & Country is a fine vehicle, and have no problem with saying that. It starts, as many things do, with the price: the base MSRP of the 2013 Odyssey LX is $28,575,* while the base MSRP for the 2013 Town & Country comes in at $29,995. These saving’s don’t stop at the gas pump! The LX edition of Honda’s minivan is capable of achieving an EPA-estimated 18 mpg city/27 mpg highway/21 mpg combined,* impressive for such a large vehicle. Chrysler’s entry posts numbers that are strong, but inferior, at 17 mpg city/25 mpg highway/20 mpg combined. Safety is paramount for any family vehicle, and the new Honda minivan delivers the goods, with the National Highway Traffic Safety administration awarding it five stars (out of five) for overall vehicle safety. The Town & Country only earned four stars for overall safety. The interior is crucial for any minivan, and Honda delivers here, too, providing 148.5 cubic feet of maximum cargo volume and 172.5 cubic feet of passenger volume. The Chrysler, on the other hand, will give you 143.8 cubic feet of maximum cargo volume and 162.8 cubic feet of passenger volume. 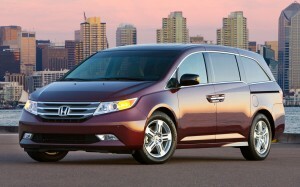 Goshen, NY drivers love the 2013 Honda Odyssey, and we’d love to show you why! Visit our dealership today to take a test drive and to see the rest of the new and pre-owned vehicles we have to offer. In the meantime, check out our Facebook page to stay up to date on our inventory and specials. **Based on 2013 EPA mileage estimates. Use for comparison purposes only. Do not compare to models before 2008. Your actual mileage will vary depending on how you drive and maintain your vehicle.